Pokémon meets Ghostbusters meets Etrian Odyssey? 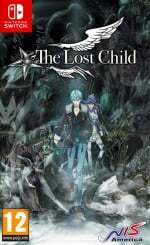 If you find the setting for most modern JRPGs to be rather too much like the old JRPGs, The Lost Child might be of some interest. Set in present-day Tokyo, it casts you as Hayato, a junior reporter for an occult magazine who soon falls into the old journalistic trap of becoming part of the story. Early in the game you're saved from a spooky subway death by a mysterious woman, who hands you a freaky-looking suitcase before fleeing the scene. Around the same time you're introduced to an altogether less evasive (though no less mysterious) woman in Lua, who claims to be an angel. She proceeds to inform you of your destiny as The Chosen One in a battle between Heaven and Hell. This might seem like a clunky TLDR summary of The Lost Child's premise, but that's precisely how the game's opening 30 minutes or so makes you feel. It's a whirlwind of improbable events, clashing theologies, confusing perspective shifts and nonsensical exposition. The thrust of this story is actually quite interesting, but the actual telling of it leaves something to be desired. It might be a translation issue, or just the fact that many of the people you meet in this adventure aren't actually people at all, but there's something off-kilter and strangely inhuman about The Lost Child's characterisation. We're all for quirky story-telling and dark humour, but the detached way in which the game's characters react to its crazy events makes it difficult to warm to them. Unfortunately, the gameplay doesn't do quite enough to rescue the situation. In between its bizarre narrative sections - which have the feeling of a narrative adventure thanks to the addition of occasional response choices - and some light Professor Layton-style sleuthing, there are lots and lots of old fashioned dungeon crawling to be done. 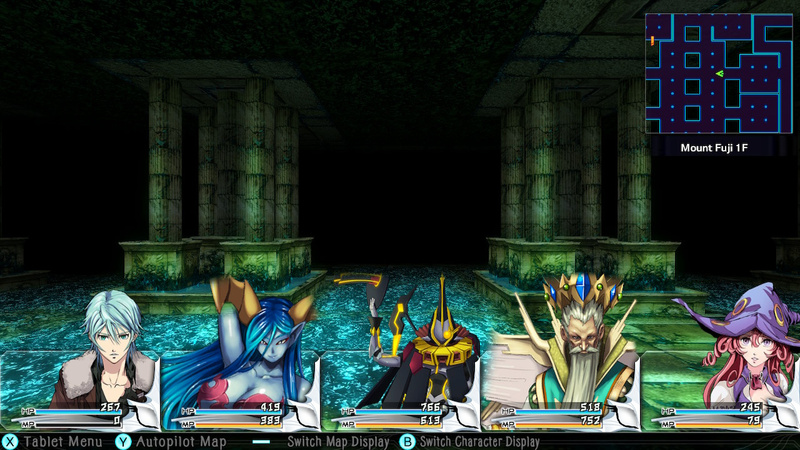 These dungeons (or 'Layers' in the game's terminology) share much in common with the Etrian Odyssey series. They're brutally basic first-person environments that need to be moved through and mapped out one tile at a time. There are doors to be unlocked, chests to be discovered and opened, and, of course, lots of turn-based battles to be fought. There's nothing particularly fresh about those battles either. Every now and then your progress through the blocky, repetitive Layers is halted, and you're presented with a line of assorted abominations to tackle in order. For each of your five party members you have the opportunity of attacking, defending, or utilising one of their special skills. Hayato himself has the most interesting ability of all - a device that combines the attributes of a Ghostbusters proton pack and a Pokémon Poké Ball. Once the device's meter fills up through sustained attacks, you'll be able to capture any of the spirits, demons and monsters that you face. The key part to this - and undoubtedly the best part of The Lost Child in general - is that you can then turn these captured 'Astrals' to your side. These spectral turncoats fill out the middle three slots of your party, adding their own elemental attributes, special attacks and passive abilities to the mix. Throw in a Pokémon-style evolution and levelling mechanic, and you might find yourself caring more about your otherworldly minions than you do the shallow characters of the story. Visually, The Lost Child is a curious and disjointed mix. There's something of a disconnect between the aforementioned drab 3D maze-like dungeon environments and the finely detailed (if overly lascivious) character art. Both the story and battle sections suffer from a distinct lack of animation, too, which only adds to the stilted lifelessness of it all. Overall, the game simply lacks the sparkle, wit and variety to match its outlandish premise. It might come with a modern setting and interesting monster-catching angle, but mechanically The Lost Child is still stuck in the JRPG dark ages. The Lost Child is a JRPG with a number of quirky and interesting elements, not least of which is its Pokémon-like monster capture system. However, its dungeon crawling underpinnings are just too dull and repetitive, and its narrative approach too stilted to draw in anyone but die-hard fans of the genre. Even then, you'll need to come prepared to grit your teeth and grind. Darn, was hoping this would be good. I was hoping this would be good but all the reviews I have seen seem to say it is not. Sounds good enough for me. Maybe not overly inventive, but that's no news in Fiction either. Just another story that used a combination of familiar interactive tropes and familiar recipes. As a curious potential buyer (and thus supposed target audience for such articles, even if I rarely read them nowadays), I'd rather read more in-depth about the mechanics of the game rather than subjective assessments of "shallow characters" - passages like this tell nothing about the story's quality and have low-to-none empirical value. Yes, I'm one to talk, and I can only hang my head in shame about the "reviews" I used to do for retro gaming fanzines back in the day, but the point still stands. For instance, what about EO comparisons - do you have to map things out by yourself? With every other first person dungeon crawler seemingly getting the comparison, some folks seem to forget what made Etrian Odyssey stand out - precisely the MINIMAL automapping and the necessity to outline all the walls, turns and points of interest manually. If it's just about a separate screen automap, they date back decades. I dont think its that bad.i like these type of games a lot.its not as good as SMT.far from it.but i like it. So to sum up this review, in the immortal words of Ray Parker Jr.: There's something weird, and it don't look good. I'm halfway through and this is way better than a 5/10. It's very obviously a Shin Megami Tensei clone and a good one at that. It's a little irritating to see yet another review that doesn't even acknowledge the existence of SMT as this might as well be called Legally Distinct Demon Capturing Game. Every single aspect is a reflection of SMT down to the astral voices! The only missing features are demon negotiation and fusion which is pretty significant, but there's much more emphasis on leveling astrals which is contradictory to the point of fusing demons. I also disagree that there's any grinding at all. Karma, which is used to level astrals, is given out very generously after battles. Astrals only evolve to increase their level cap and it also drops the back down to level 1. Any similarities to Pokemon are incredibly shallow. Im enjoying it, for what it is. I have a friend who has charted 80 hours into this already. Hoping to see if the game was better than what this says it is going to be. This will be a budget purchase for me at some point. Too many other games to worry about right now, though. I hate first person dungeon crawling RPGs anyway, so this is no loss to me. There was this and Labyrinth of Refrain. I pre-ordered Refrain because it looked more interesting. 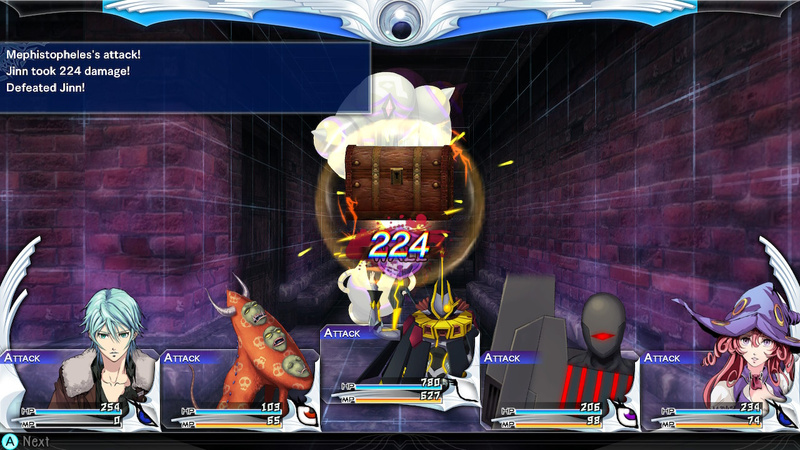 NIS JRPGs always seem to be a mix of hit and miss for me. I have only really enjoyed some of the Hyperdimension (and Cyberdimension) games on PS3/PS4. Didn't play many of their 3DS outings. This looks alright but probably best to wait for a sale.. whenever that'll happen. I love this game so far (I'm about to play it on my bus ride home, in fact), but I don't think this review is unfair. At its core, The Lost Child is a common-or-garden old-school dungeon crawler. 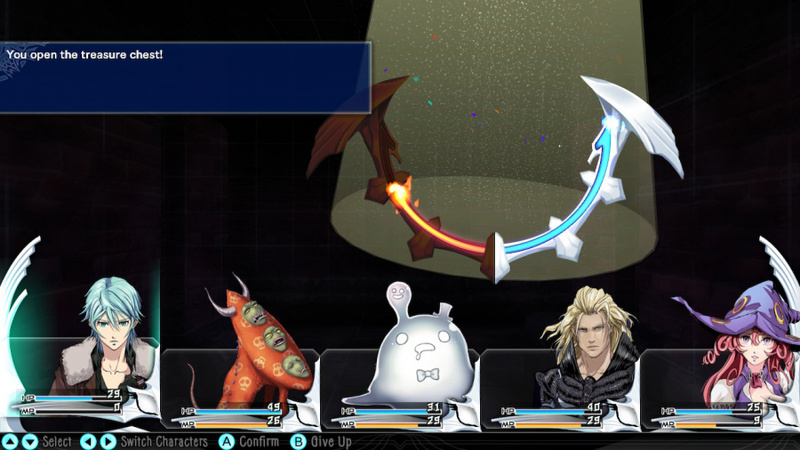 It has a little extra spark, though, for fans of El Shaddai: Ascension of the Metatron, H. P. Lovecraft, and stories that weave in religious themes. It's no Shin Megami Tensei, that's for sure, but if you're interested and this review disppoints you, it may be worth your time and money to give the game a try. The Lost Child may yet surprise you. I'm about 30 hours in at the start of the 5th chapter and I've been enjoying it overall. If this had SMT's staple mechanics, it could easily fit in with the rest of the Devil Summoner spin-off titles. My only gripes are that the demon designs range from "Passable..." at best to "Why? ...Just why?" at worst, and organizing and managing your Astrals (trading skills between them) could have been streamlined a bit better. I also see an untapped potential that maybe a different, more ambitious team or studio could have brought out, but all things considered, I recommend it to anyone who's curious. @Lameborghini is Tokyo Mirage coming to switch? @H_Hunter It has not been announced, but it’s gotta be inevitable. Persona is hot right now, and so is Fire Emblem, and TMS is a game that combines both and didn’t sell well. Atlus has got to realize that it will sell much better on Switch. I am a pretty big JRPG fan, but a game made in 2018 shouldn't have less animation than a game made in 2000. Further, what draws a player into JRPGs, or at least me, is a combo of game-play and storytelling. Hearing that the story is awkward and disconnected is a serious turn off. All said, that monster catching mechanic sounds pretty interesting, it's a shame the rest of the package sounds so weak. Much, much better than a 5/10. @nhSnork i cant get into EO, i thought i really would but i found the mapping very tedious and the dungeons very dull, its why i have not got persona q yet. Funnily though i dont mind random encounters in jrpgs, unless their frequency is absolutely maddening. Maybe i just dont like first person dungeon crawlers, i played the heck out of swords and serpents on NES as a kid and i guess that did it for me, the genre has barely innovated since then if you look past graphics. I had to map on graph paper in the nes days! No stylus touch screen then! I recently started playing srpgs again and im on an imageepoch binge with luminous arc right now. But Maybe i should revisit EO one day, i started out with the fafnir knight i think its no. 4 or maybe 5. I thought the story was pretty weak though and didnt like the talking portraits in the town, the whole experience just feels flat to me. Maybe theres a better EO game? Rpgs of all stlpes are generally my favourite genre though. Looking forward to octopath and ys viii. @LunarFlame17 Thanks.. I really hope they release it. It’s one of those good games I, for some readon, skipped on the Wii U. The score feels a little bit low, imo. I think TLC is a nice SMT-lite game. It's a good stopgap while we're all waiting for SMT V.
I find this game interesting... Everything about it just feels like it's stolen from the SMT series, but I don't mean the modern SMT, I mean the PS1 era SMT, Soul Hackers in particular comes to mind from the presentation. It's not completely terrible in my opinion, it just feels like it's not a game that would be made today. I liked the premise, but I got a SMT/Etrian Odyssey vibe from it, which isn't my cup of tea. With all the other games I have to play, including the backlog, I'll pass. @bolt05 Fafnir is the 3DS remake of the second game, I think. I haven't played that far yet since I'm still in the Atlusliciously brutal postgame of the first DS entry. But while I didn't have any games on NES (read: a Famicom knockoff with bootleg cartridges, that's all there used to be here for along while) that required particular mapping, doing that on the DS touchscreen proved really fun for me, especially since my map exploration fire had already been fanned by SMT Strange Journey at that point. Never minded first-person dungeon crawlers myself (perhaps because one of them, Shining in the Darkness, was estimatedly my first JRPG ever), and the story in the first game is subtle but not without a couple late game twists (concerning both the plot and the later areas you discover) that were very much to my liking. But nothing will ever be for everyone of course.